A simpler version of this recipe originally appeared in Bon Appetit Magazine but has since been enhanced to add honey to balance out the savory and salty flavors! If you're unfamiliar with this type of breakfast, peanut butter toast is a simple and fast way to instantly get protein into your system and also helps boost low blood sugar levels. 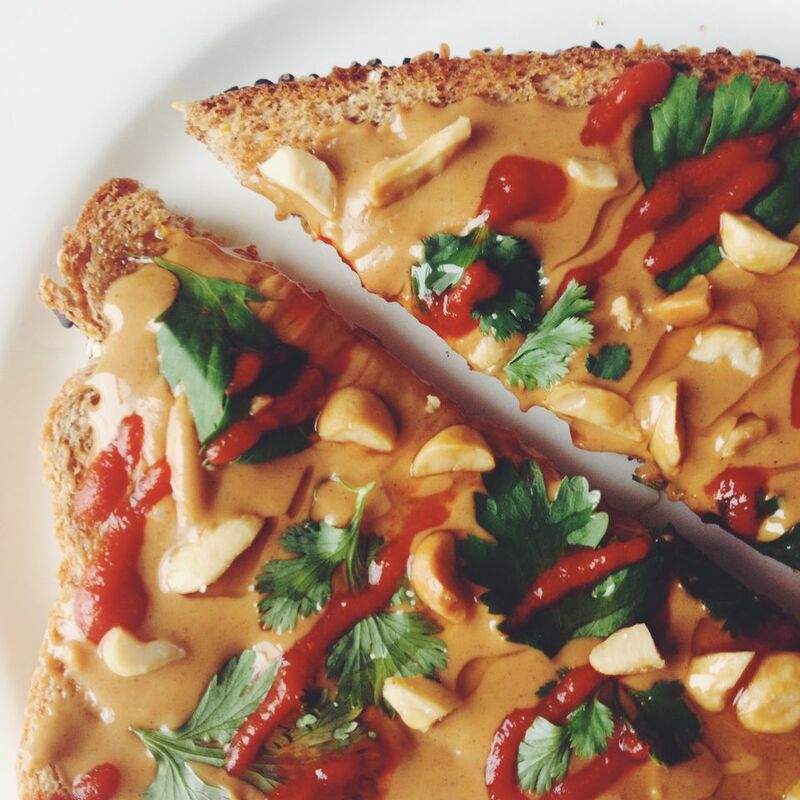 When sriracha, lime juice, and cilantro are added, this open-faced Thai sandwich gets even more flavorful and much more exciting. Even though it sounds sort of strange once you try this Thai Toast, you'll have a new go-to breakfast that's quick, easy and delicious. And best of all, it's good for you! Note: We always recommend using fresh, local and/or organic ingredients because hey, let's be real—they just taste better! Begin by toasting one slice of wholegrain bread. Next, smear on some peanut butter, we recommend the kind that you can grind yourself at Whole Foods, drizzle with honey. Next, add the chopped cilantro and the chopped peanuts and finish with a drizzle of sriracha—more or less depending on how spicy you like it. Before serving, douse it with the juice of 1 lime wedge and serve immediately. If you need to take it on the go, just cut the toast in half and make a sandwich out of it.